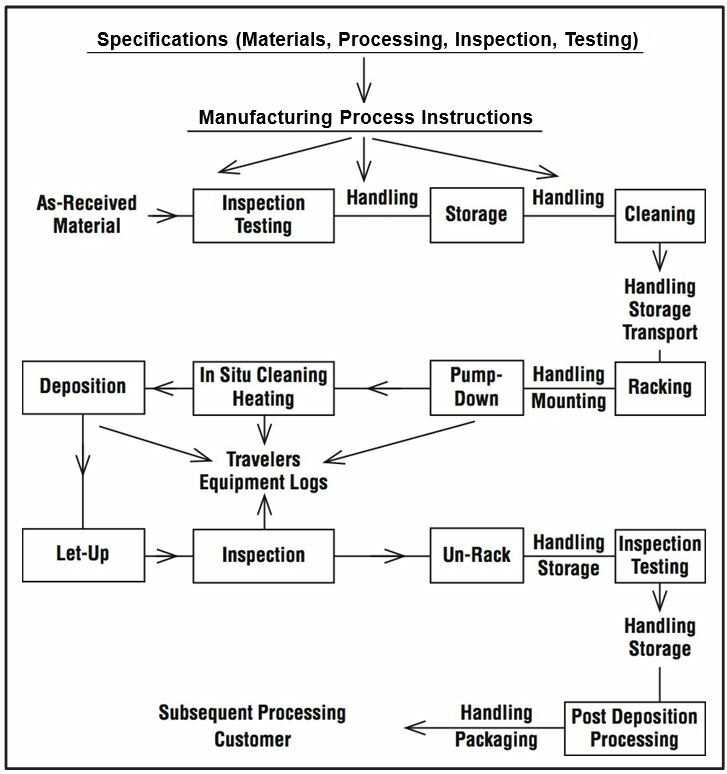 Process Flow Chart | Management Plus, Inc.
Every PVD process should have a Process Flow Chart that depicts each stage of the processing from the specification and testing of the as- received substrate and source material, to the packaging and handling of the final thin-film product. Figure 1 shows an example of a Process Flow Chart. All stages of the processing and product evaluation should be covered by written Manufacturing Process Instructions (MPIs), and critical aspects of the processing and product evaluation should be covered by written Specifications. Specifications (“specs”) are essentially the “recipe” for the process. Specifications define what is done, the critical process parameters, and the process parameter limits that will produce the desired product. 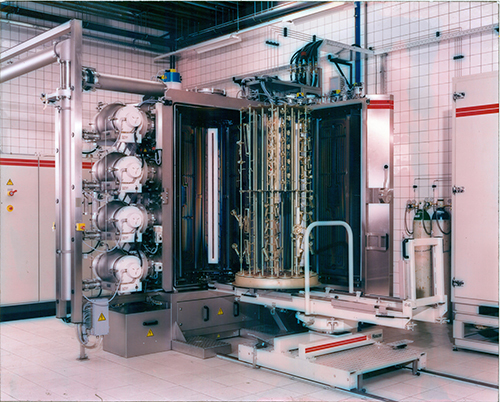 The specification can also define the substrate material, materials to be used in the processing, handling and storage condition, packaging, process monitoring and control techniques, safety considerations, and any other aspects of the processing that are important. Specifications should be dated, and there should be a procedure available that allows changes to the specifications. Reference should be made to the particular “issue” (date) of specifications. Specifications should be based on accurate measurements, so it is important that calibrated instrumentation be used to establish the parameter windows for the process. Specifications usually do not specify equipment and noncritical process parameters. Specifications can also be used to define the functional and stability properties of the product and associated test methods. Manufacturing Processing Instructions (MPIs) are derived from the Specifications as they are applied to manufacturing and evaluation procedures using specific equipment. Often the MPIs contain information that is not found in the Specifications but that is important to the manufacturing flow. The MPIs may be instructions, such as the type of gloves to be used with specific chemicals (e.g., no vinyl gloves around alcohol, rubber gloves for acids), or they may cover portions of the processing, such as handling and storage, that are not covered in the Specifications. The MPIs should be dated and updated in a controlled manner. The MPIs should also include the appropriate Material Safety Data Sheets (MSDSs) for the materials being used. A detailed Process Flow Chart aids in ensuring that all aspects of the processing is covered by an appropriate MPI . Without the flow chart it is easy for some aspect of the processing, such as handling or storage, to be overlooked. This can lead to process variability because that portion of the processing may not be performed in a reproducible manner. The Traveler is an archival document that can be used to determine how the product was processed if questions arise about the performance of the product . It accompanies each group of substrates that is processed and documents the Specifications and MPIs used, the equipment used, the processing parameters, and any observations that are made by the operators or inspectors . In manufacturing, it is important to keep Equipment Logs for the equipment and instrumentation being used. These logs contain information about when the equipment was used and for how long, its performance, any modifications that are made, and any maintenance and service that has been performed. The Equipment Logs can be used to establish routine maintenance schedules and determine the Cost of Ownership (COO) of that particular equipment. When the equipment is being repaired or serviced, it is important to log the date, action, and person doing the work. The Equipment Log should also contain the Calibration Log(s) for associated instrumentation, where applicable. This entry was posted in Process Flow Chart on April 25, 2018 by Don Mattox.